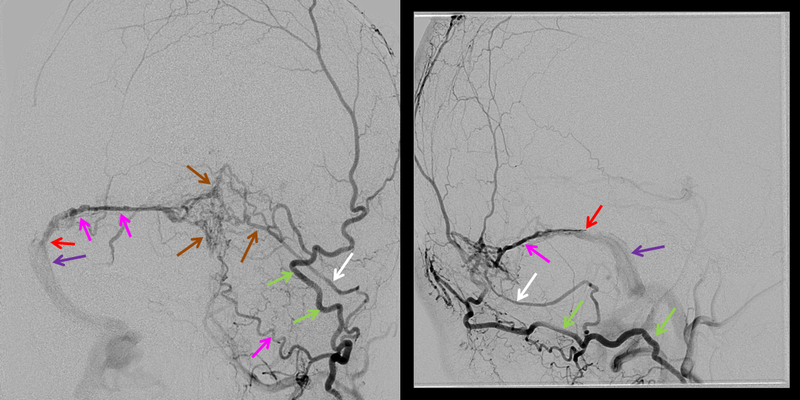 Contralateral left ECA injection, demonstrating innumerable torcular dural arteries (brown), supplied by transmastoid branch (white) of the occipital artery (green), feeding into the fistula via a common arterial channel (pink) within the medial wall of the transverse/sigmoid sinus — this artery can also be supplied via the jugular division of the ascending pharyngeal artery. The fistula itself (red arrow) is better seen from this injection, without overlying branches of the right ECA injection. 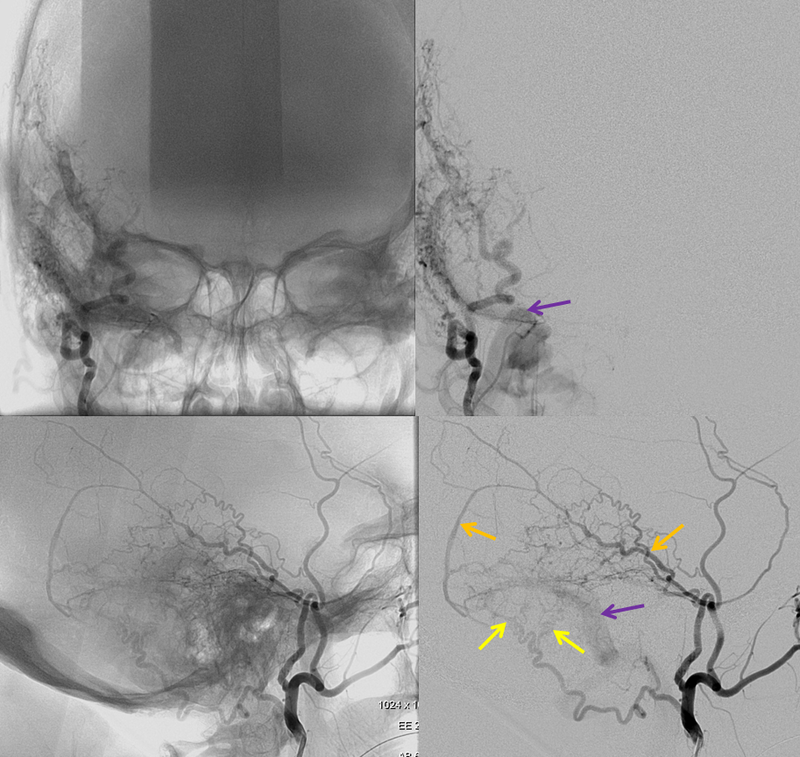 A microcatheter (SL-10, white) is now placed into the distal right petrosquamosal branch (dark yellow) of the middle meningeal artery. 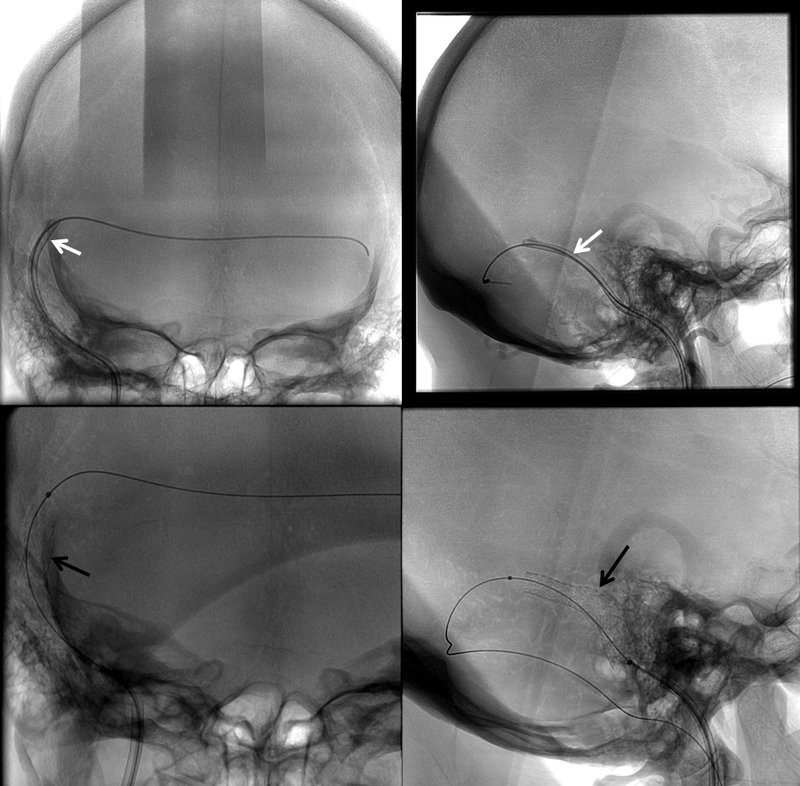 Because the middle meningeal branches are straigher and better supported by adjacent dural and skull, a substantially more distal catheterization, hense closer to the fistula, is possible as compared with the tortuous occipital artery, which meanders within relatively unsupportive soft tissues. 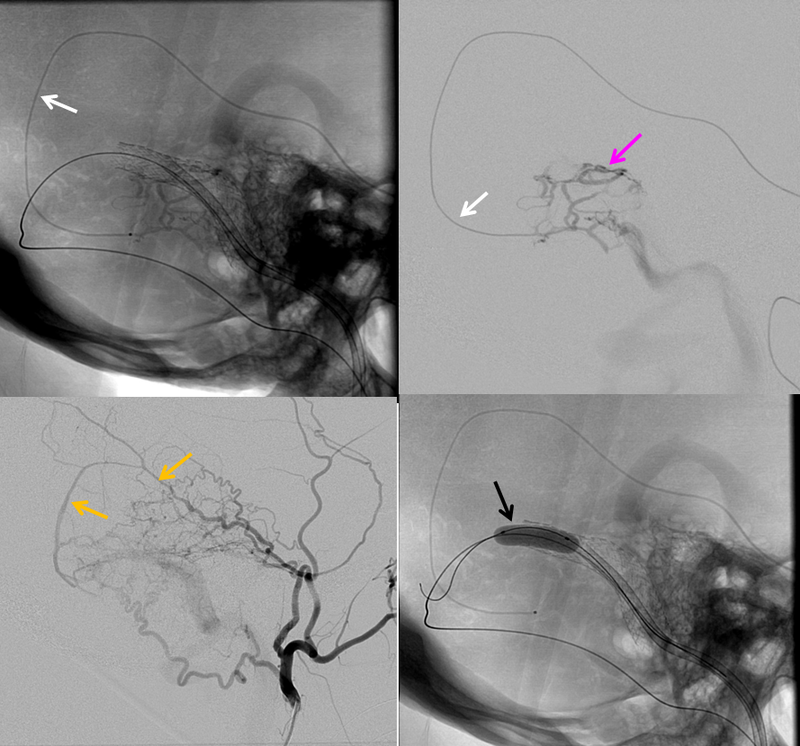 A microinjection visualizes multiple arterial feeds to a part of the fistulous arterial channel (pink), and portions of the sigmoid sinus are visible. 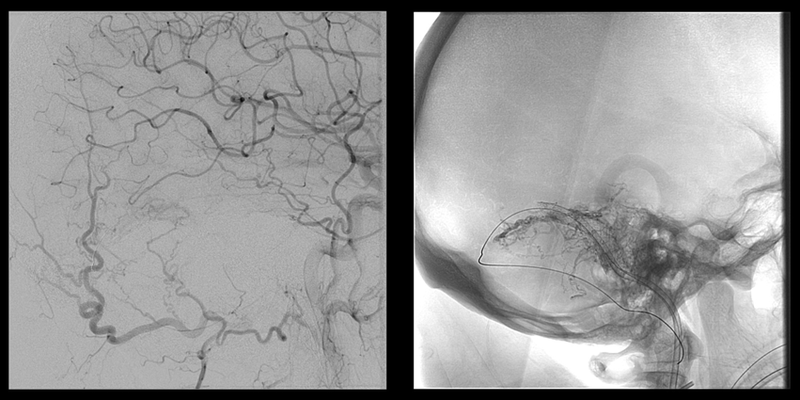 Finally, a compliant balloon (Hyperglide) has been inflated in the transverse sinus and distal stent to further protect the sinus from glue clumping. Movie of the glue shot is shown below. At the start of the movie, there is already glue present in the vasculature, so not all glue deposition is recorded. The catheter is pulled back in the middle of the movie, and glue permeates another channel, coming in contact with the balloon. This causes the balloon to rupture (these balloons always pop on glue contact) and deflate, appearing as a negative white image on a live subtraction image. The catheter is then pulled. Post-glue static images, demonstrating the glue cast in relation to the stent. Most of the glue is located medial to the stent. Right CCA injection, demonstrating decreased flow through the fistula. Part of the fistula remains open (purple arrow pointing to sigmoid sinus). Notice that flow is now mostly retrograde in the sinus, because some glue inivariably gets into the vein around the stent. 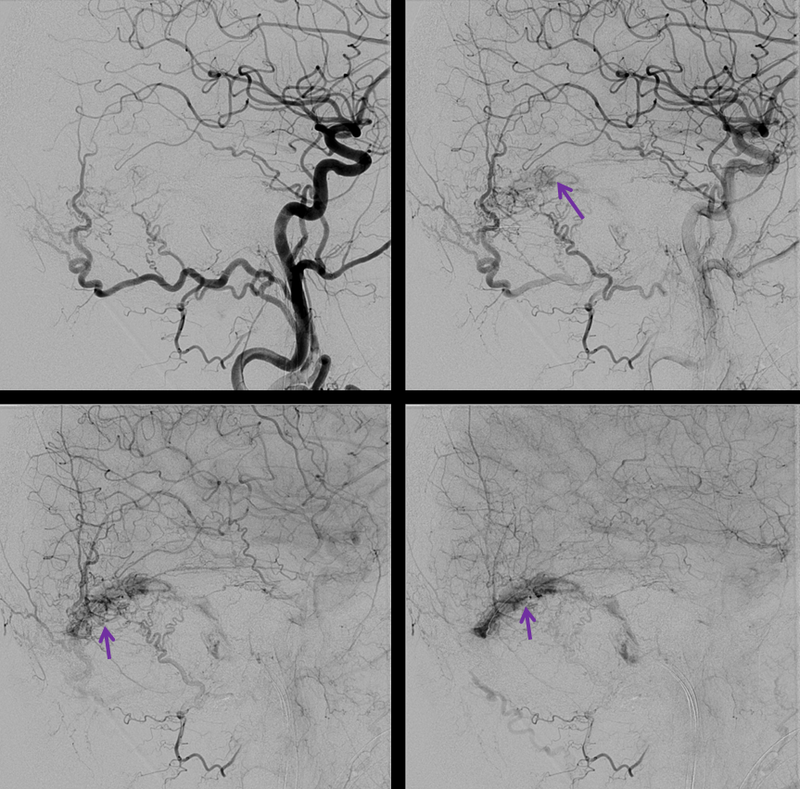 The petro-squamosal branch is re-catheterized to address residual fistula. Notice a common arterial channel (pink) proximal to the sinus. A second n-BCA injection is performed. 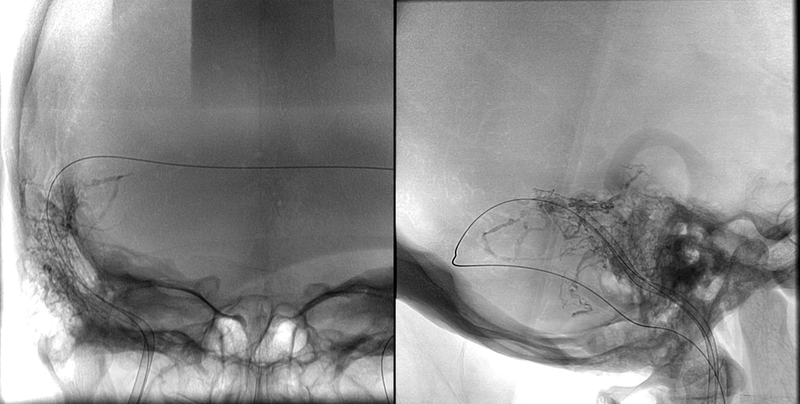 A second precise stent was placed into the sigmoid sinus proximal to the fistula, to squeese intra-sinus glue against sinus walls and faciliate antegrade fllow (stent deployment shown) Post-stenting control angiogrpahy from left CCA shows no reconstitution of the fistula through the torcular branches. The flow in the right sigmoid sinus is now freely antegrade. Control injection of the left vert, also demonstrating no more fistula. All potential sources of re-supply must be checked before fistula is considered closed.